President Trump's daughter Ivanka has criticised "the level of viciousness" her father has been subjected to. She said that it went far beyond what she was expecting. In the interview with the Fox and Friends morning TV show, she said that she had been left blindsided by the ferocity of some of the attacks levelled against the president. Her father is under intense scrutiny in the US, including over the Russia investigations and his business ties. Ms Trump said that she felt "very vindicated" by James Comey's recent Senate testimony, in which the former FBI director spoke about the probe into alleged links between the Trump election campaign and Moscow. She said his evidence supported her father's insistence that he was not being personally investigated, and that Mr Comey had on at least one occasion supplied a leak to The New York Times. Ms Trump said that while she was "not expecting the intensity of this experience", she realised that the business of government "isn't supposed to be easy". "My father and this administration intends to be transformative, and we want to do big, bold things," she said. "With all the noise, with all the intensity of the media coverage... ultimately, we're really focused on why the American people elected Donald Trump as their president." 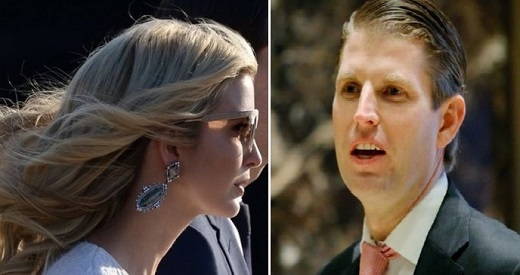 Last week Ms Trump's brother Eric told Fox News that he had "never seen hatred like this" and "morals have flown out the window". "They're not even people," he said as he described his father's critics.